↑ "34th Annual Young Artist Awards". YoungArtistAwards.org. Archived from the original on 2 April 2013. สืบค้นเมื่อ 31 March 2013. ↑ Douglas, Edward. 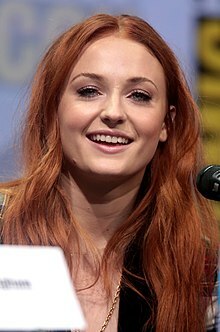 "Interview: Game of Thrones' Sophie Turner Doubles Down for Another Me". สืบค้นเมื่อ 23 August 2015. ↑ Kroll, Justin (January 22, 2015). "Sophie Turner, Tye Sheridan, Alexandra Shipp join 'X-Men: Apocalypse'". Variety. สืบค้นเมื่อ May 27, 2016. ↑ Fleming, Jr., Mike (June 14, 2017). "Fox Formalizes Simon Kinberg To Helm 'X-Men: Dark Phoenix'; Jennifer Lawrence, Michael Fassbender, James McAvoy Back, Jessica Chastain In Talks". Deadline.com. Archived from the original on June 27, 2017. สืบค้นเมื่อ June 27, 2017. ↑ "Game of Thrones: Cast". HBO. สืบค้นเมื่อ September 30, 2016. ↑ "The Thirteenth Tale : Cast". BBC News. สืบค้นเมื่อ January 12, 2017. ↑ "Game of Thrones' Sophie Turner appears in Bastille's Oblivion music video". Mail Online. 22 July 2014. สืบค้นเมื่อ 28 July 2014. หน้านี้แก้ไขล่าสุดเมื่อวันที่ 1 กรกฎาคม 2561 เวลา 21:35 น.